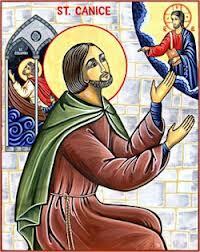 St. Canice good humour and readiness to help won him many friends and helpers in preaching the Good News. Although St Kieran of Seir is the primary patron of the Catholic diocese of Ossory, St Canice of Aghaboe is its secondary patron. It is Canice who has given his name to the city of Kilkenny (Cill Cheannaigh = Canice’s church). He is also known in Scotland as Kenneth or Kenny. Patrick Duffy puts together many of the traditions about him. The coming of Christianity to the diocese of Ossory is associated with St Kieran, a fourth and fifth century saint, who came originally from Cape Clear in Cork and settled at what is now Seir Kieran near Clareen, Co Offaly. This area is actually an island of Ossory diocesan territory surrounded by parishes of Killaloe. The diocesan college, St Kieran’s College, Kilkenny, founded as a seminary in 1782, is called after him. But who was Canice? Saint Canice is the other patron saint of Ossory and Kilkenny (The Irish Cill Cheannaigh means “the church of Canice”). 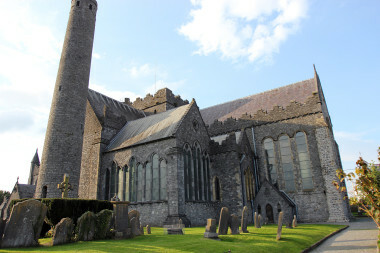 The Church of Ireland Cathedral and a large Catholic parish church in the city are called after him. Tradition has it that Canice was an Ulsterman; some would even call him a Pict. Born at Keenaght near Dungiven, Co Derry, in Northern Ireland in 527 his father Lugayd was a distinguished bard, originally from Inis-Doimhle in the River Suir near Waterford. 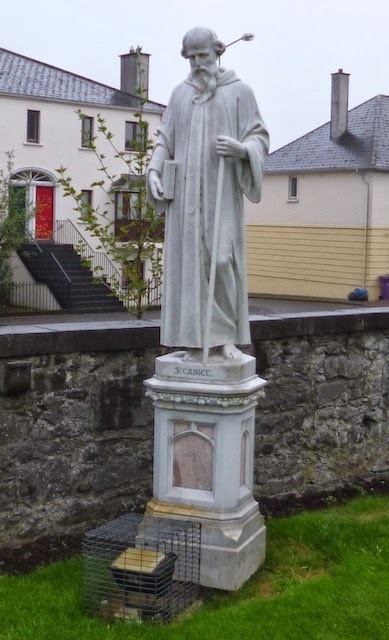 While Canice’s earliest years seem to have been spent herding flocks, he went as a pupil of St Finian’s monastic school at Clonard, Co Meath in 543, where he became a friend and companion of St Colmcille. They may also have studied together at the school of St Mobhi at Glasnevin. When plague scattered that community, tradition says he went as a monk to Llancarfan in Wales, under Saint Cadoc, where he was ordained. He is said then to have set out for Rome to get the blessing of the reigning pope. In 550 we find Canice is back at his home place Glengiven, near Dungiven, Co Derry. Here he converted his foster-brother, Geal-Bréagach (Latin Albus Mendax), who afterwards assisted him in founding a monastery at Drumachose, near Limavady. Canice is reputed to have founded a monastery in the sixth century in near Aghaboe, Co Laois. When this actually took place is uncertain, but it seems more probable that it was after his return to his home in Dungiven. Aghaboe grew in importance, and in the following century sent out St Feargal (died 784) as a missionary to the church of Salzburg. Aghaboe become for a time the bishop’s see, but under Norman influence in the last decade of the twelfth century the see transferred from Aghaboe to Kilkenny. In 565 we find Canice as a missionary in Scotland where he is known as Kenneth (Kenny) or Ceannach. He is said to have accompanied Colmcille on a visit to King Brude of the Picts, then dwelling at Inverness. Canice’s name is associated with many place names both in the islands and the mainland – the ruins of an ancient church, Kil-Chainnech on Tiree Island, with Inchkenneth on one of the isles of the Hebrides and with a burial ground, Kil-Chainnech, in Iona. Also Cambuskenneth near Stirling. St Adamnan (= Eunan? 679-704), the ninth abbot of the monastery of Iona, wrote a Life of St Columba: he mentions Canice three times. The first mention tells that once when a wild tempest was blowing on Iona, Columba said to his monks: “Make ready a lodging and draw out water for the washing of the feet of guests”. In surprise a brother asked: “Who could possibly arrive safely across the sound on a windy and dangerous day like that?” “God has granted a holy man a calm, even in the storm.” And that same day, Canice arrived according to the prophecy of the saint. At another time, when Canice was at his monastery at Aghaboe, Columba and some companions were at sea when a storm threatened to capsize their little boat. The shipmates became frightened, but Columba told them not to be afraid. “God,” he said, “will listen to Canice, who is now running to church with one shoe to pray for us.” It would seem that God, at the same time, had revealed to Canice his friend’s response. For at that very moment, it was later learned, Canice had jumped up from the table in his monastery at Aghaboe and rushed off, half-shod, to the church. St. Columba’s boat, of course, made it to safety. The third story tells that Canice, when sailing past the island of Islay on his way back to Ireland after a visit to Iona, remembered he had left his staff behind him at the harbour in Iona. He decided to pull his boat into a harbour at the southern end of Islay and there on on the ground as he landed, he found his staff. St. Canice knew how to make the best of a situation. His good humour and readiness to help won him many friends and helpers in preaching the Good News. We can ask him to show us how to be as good and cheerful a friend as he was. Canice died in 603. It is not easy to distinguish fact from fiction in the traditions surrounding St Canice. The legends live on to inspire those to whom they are told. As the Italians say: Se non è vero, è ben trovato. A rough translation might be: If it’s not true, it’s still a good story.